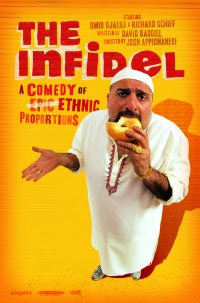 When I first heard about David Baddiel's The Infidel (back when they were looking for actors) I was a little hesitant - a British, religious comedy, based around Judaism and Islam? Crikey that sounds dangerous! After regulary visiting The Infidel website (http://infidelmovie.com/) to catch up on production progress, checking out the numerous humourous behind the scenes clips on the site and viewing the trailer below - I can't wait to see the film. It looks sharp, witty, engaging and absolutely hilarious. Once again a case of not judging a film by it's name. It looks like Revolver have got a hit in the bag. Bonus! Tonight The London Film School are hosting a special sneak preview of ‘The Infidel’ with director Josh Appignanesi. Meet MAHMUD NASIR, loving husband, doting father and something of a “relaxed” Muslim. Does the “F” word occasionally pass his lips? It’s hardly worth mentioning. Does he say his prayers five times a day? Of course! Well, usually… Does he fast every day of Ramadan? Who’s counting anyway? He may not be the most observant, but in his heart he is as Muslim as it gets. But after his mother’s death a discovery turns Mahmud’s world upside down. He finds his birth certificate which reveals that not only was he adopted at birth…but he’s Jewish, and his real name is Solly Shimshillewitz! The London Film School has a few places left on our March workshop with Josh Appignanesi, but it is booking up fast. Contact workshops@lfs.org.uk. How do you tell a story visually? What makes a film a film, and not TV? We could say a "real" movie is one that's comprehensible with the sound turned off, but where do we start? With inspiring film examples, practical storyboarding exercises, and analysis of participants' own films, this 2-day workshop takes participants shot by shot into the heart of cinema. More info. Update: You can follow Infidel Producer Arvind Ethan David on Twitter here @ArvD & his blog over here > http://slingshot-studios.com/blog/ on his Sling Studios Productions website.